Son of Henry Beaman Randall and Muriel Willene “Willie” Maret, Thomas Edwin Randall was born August 13, 1914 in Lavonia (Franklin County), Georgia. In May of 1922, all city streetcar operations were taken over by the City of Detroit under its newly formed “Department of Street Railways” — better known as the D.S.R. Shortly thereafter, the City of Detroit also entered into the transit bus business when the D.S.R. 's Motorbus Division began operations in January of 1925. After January, 1932, all public transportation within the city limits would be operated solely by the D.S.R. During the D.S.R. era, the City of Detroit operated one of the largest municipally owned and operated transportation systems in the world. During its heyday, the city-owned system operated a fleet of well over 2,800 vehicles, including streetcars, electric trackless trolley-coaches, and motorbuses. In April, 1956, the last of the streetcars were removed, and diesel buses took-over. By 1940 (according to the 1940 U.S. Census), Thomas Edwin Randall had moved with family to Wayne, MI (near Detroit, MI). There, his family lived with his Father, Mother, and his 81 year old grandfather, Joseph W. Maret. The Randall family rented a house at: 157 Grove Avenue, Highland Park, Wayne, Michigan. In 1940, his father, Henry Beaman Randall (then age 49) was working in the Automobile Industry (at Ford Motor Co.) as a Crank Trimmer. His brother, Floyd H. Randall (then age 19), also worked in the Automobile Industry (at Ford Motor Co.) as an “Inspector”. Thomas (then age 25), and still living with his family, was working as a Bus Driver for the Detroit Street Railway (D.S.R.). 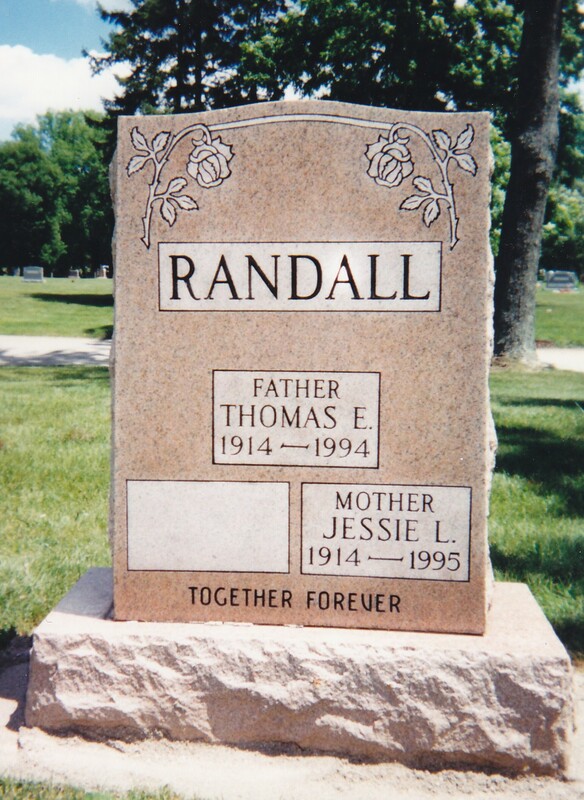 Tombstone for Thomas Edwin Randall (August 13, 1914 - Jan. 24, 1994) and his wife, Jesse L. Randall (1914 - 1995).